(L-R BACK) PATRICIA MEAGHER, GRANT RICKY, STUART KING, VERENA MCLEAN, GINA PRICE (L-R FRONT) LAURENCE PERRIN, ELLY BRICKHILL, LINCOLN DE KALB. 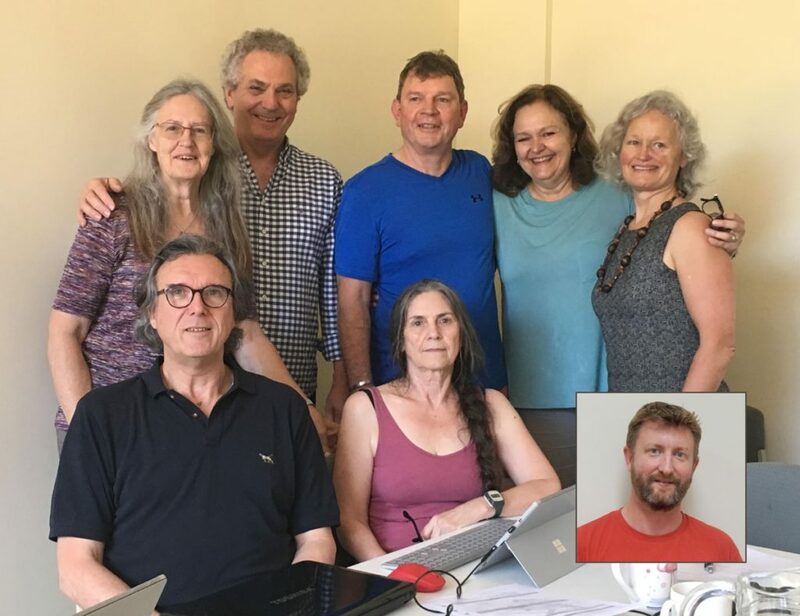 Narara Ecovillage’s Board of Directors are elected by the membership. A number of our Directors have been involved in and even on the board for much of the project bringing a huge amount of continuity and project knowledge. The Board are elected Sociocratically by the members of the village and at the last election the village felt that having an independent board member was a good thing. With that in mind, Gina Price was nominated for a variety of reasons one of which being her skills in sociocracy. The insights that she has brought to the Board have been invaluable and her commitment is shown through video conferencing into each 4 hour board meeting from Western Australia. Lincoln has been a member of the village for coming up to 5 years. He has over 20 years experience in corporate Information Technology and project delivery. Lincoln, his wife Rani and 3 kids moved to the Central Coast 5 years ago to be closer to the project and they are all ingrained in many aspects of the village. Stuart was appointed as a Board member and Chairman at the first meeting when the Co-operative was established and has continued in this capacity. For the first 4 years the 4 hour monthly Board meetings were hosted at nab’s offices which worked for Stu who worked for nab for 31 years. Stuart’s Board experience with nab subsidiaries and completion of the Australian Institute of Company Director program have been of assistance for the Board operations. Stuart has spent the last 10 years dealing with companies and individuals who are experiencing financially stressful situations which have enabled him to remain calm when unexpected events occur. This is combined with a dry sense of humour, which aids in trying not to take ourselves too seriously. Grant joined the Board in 2016 and brought with him energy and enthusiasm. One of Grant’s weaknesses is that he hasn’t learned to say no which has resulted in an unsustainable workload from time to time. He has been one of the driving forces for the Building Standards Approval process and evaluation criteria. His project management and planning skills are a real asset for the Board and are being more fully utilised in holding the stage 2 planning process, drawing on the lessons from Stage 1. Grant is always happy to see the positive in situations and people and his can do approach helps keeping the Board going forward. John has been the Project Director for the Narara Ecovillage since 2012. Previously he was the Director of the Findhorn Ecovillage Project for more than twenty years. Findhorn is a well known intentional community founded in 1962 in the north of Scotland. During that time he helped pioneer green building methods, ecological infrastructure and renewable energy systems. He is the author of Simply Build Green, and has lectured widely on the subject of building sustainable communities. John considers ‘spiritual sustainability’ as a key element to any ecovillage, along with ecology, economics and social sustainability. He’ll be talking on what that means in the context of community and why it’s important to develop our unique spiritual practice that works for us. His is golf. Former Board Members are Lyndall Parris, John Talbott, Mark Fisher, Donna Carey, Richard Cassels, Geoff Cameron and Nicky Prince.